Global Calcium Phosphate Market size was valued at over USD 600 million in 2017 and is anticipated to grow at around 5% over the forecast timespan. Potential applications such as animal feed, food & beverages, agriculture and pharmaceutical industries will propel the industry growth. Increasing bakery and dairy products demand are among the key factors driving the industry growth. Improved leavening functions, enhancing volume and aeration particularly in cookies and cakes has stimulated product demand in bakery applications. 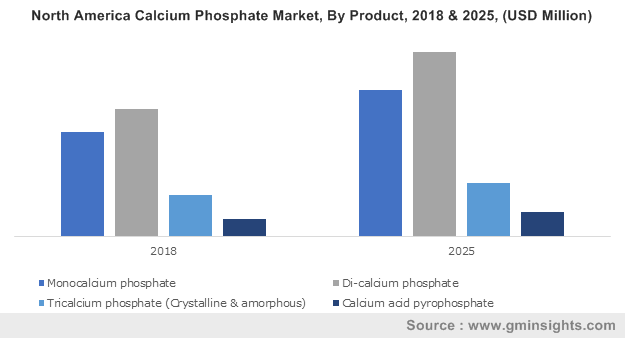 Governmental as well as institutional initiatives such as WHO promoting healthy lifestyles and food safety awareness will drive the calcium phosphate market share from 2018 to 2024. Development in biomedical sector including advancement in fracture curing to reduce bone related problems will enhance the product penetration. Human bone accounts for 70% calcium phosphate mineral. Increasing product adoption in dental and orthopaedic applications as a substitute for synthetic grafts during implant surgery has boosted the product scope. Increasing product penetration in pharmaceutical applications as fillers and binders particularly in solid oral dosages will further drive the industry demand. Rising water pollution levels has stimulated the product demand in water treatment applications owing to its efficient sorbent properties. Strong outlook in feed applications to enhance the livestock health will drive the calcium phosphate market size. High protein content along with improved product quality, safety and suitability for feed applications has enhanced the product demand. Mineral rich feed products enhance the milk production, calves’ growth rate, improves immunity and prevents metabolic diseases such as haematuria, ketosis and milk fever. Shifting farmers focus to boost crop yield, due to limited arable land will propel the industry share in fertilizer applications. In addition, rising product scope in manufacturing phosphoric acid, dental powders, luminescent materials, textiles, pottery & porcelains will drive the business growth. The product is also used as a food additive, nutritional supplement, meat tenderizer and clarifying syrups. Limited phosphate reserves globally influencing the production rates may hamper the calcium phosphate market growth. Fluctuating raw material costs along with supply deficit due to rising product demand are among major factors influencing the product price trends. In addition, presence of substitute materials along with advancement in material science may hinder the product demand. Monocalcium phosphate accounts for over 180 kilo tons in 2017 owing to its wide usage in animal feed to improve bone health will support the industry growth. High product suitability in premix and feed mixture has stimulated the product penetration. Increasing product usage in combination with baking soda in bakery applications to assist dough rise and enhance food fluffiness will support industry demand. Di-calcium phosphate will witness growth at over 4.5% up to 2024. Rising product demand in breakfast cereals, noodles, enriched flour and dietary supplements will propel the industry growth. The product is also used in pharmaceutical applications as tableting agent and in toothpastes as tartar control and polishing agent. Animal feed will observe the fastest CAGR during the forecast period 2018 to 2024. Increasing consumer demand for milk, eggs, meat and other livestock products will enhance the product growth. Significant health benefits including enhanced livestock metabolism, reproductive efficiency and strengthen bone structure will provide positive outlook for the calcium phosphate market growth. Fertilizers will register over 4% CAGR up to 2024. High application scope in plant development due to rich mineral content has enhanced the product demand. Necessity to enhance crop yield due to rising food demand particularly in agricultural economies propel the industry growth. The calcium present in the product strengthens plant cell wall, promotes proper cell elongation and participate in hormonal and enzymatic process where as phosphorus influence early maturity and increase root growth, disease resistance and crop quality. North America calcium phosphate market is anticipated to worth at over USD 180 million by 2024. Increasing old age population, resulting in higher joint and bone health supplements demand will support revenue generation. High R&D investments to develop nutrition rich products will support the industry growth. According to CDC (Centre for disease control and prevention) 78.4 million adults will report arthritis by 2040. Asia Pacific calcium phosphate market will register growth at over 4.5% up to 2024. Increasing healthcare expenditure and nutritional supplement due to geriatric population will fuel the industry growth. Shifting government focus in producing high quality crops using fertilizers will positively influence the industry demand. 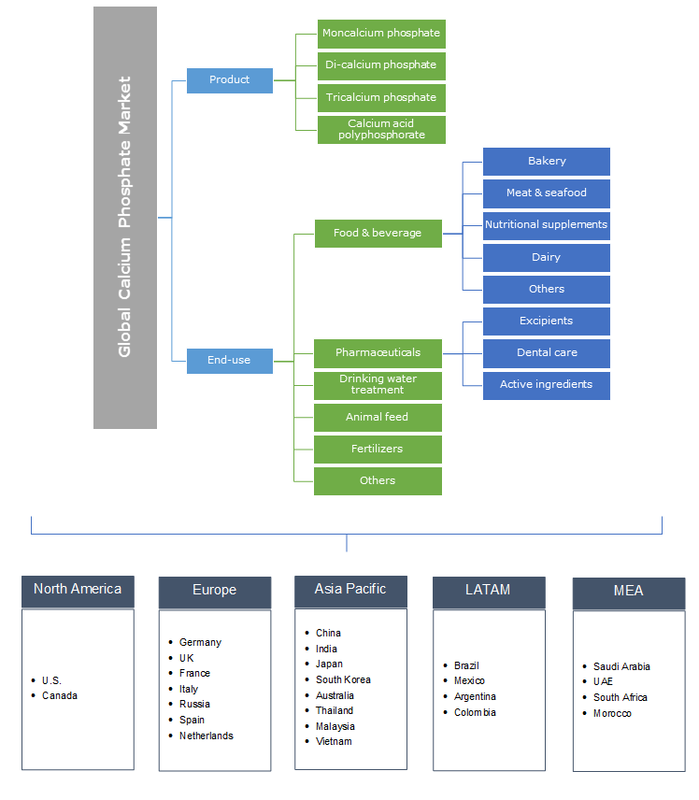 Calcium phosphate market is highly fragmented due to the presence of large number of players operating in regional as well as international markets. Some of the major players included are Mosaic Company, Merck Millipore, Chemische Fabrik Budenheim, Innophos Holdings, OCP Group Chemicals Company and Gadot Biochemical Industries. Several industry participants are involved in mergers & collaborations, to strengthen their foothold. For instance, in January 2018, Potash Corporation completed its merger with Agrium to form Nutrien. Strategic investments in R&D to meet consumer expectations and capture a larger share in the market is widely observed among the manufacturers. Other notable players include Nitta Gelatin, Advance Inorganics, Euro Chem, Elixir Prahovo, Reanjoy Laboratories and KEMAPCO Arab Fertilizers & Chemical Industries. Global phosphate industry growth is driven by advancement in agricultural and pharmaceutical industry. In agricultural fields, fertilizers are used to increase life span and productivity of crops and plants whereas in pharmaceutical it is used in medicine to prevent kidney stone in human body. The calcium phosphate compounds are widely used for bone grafting and dental applications. The increasing demand for healthy nutrients and feed products will propel the industry demand. Growth in geriatric population particularly in developed regions are expected to have positive outlook for industry growth. Favourable socio-economic conditions along with improving living standards in emerging economies including India, China and Brazil will support the industry demand.